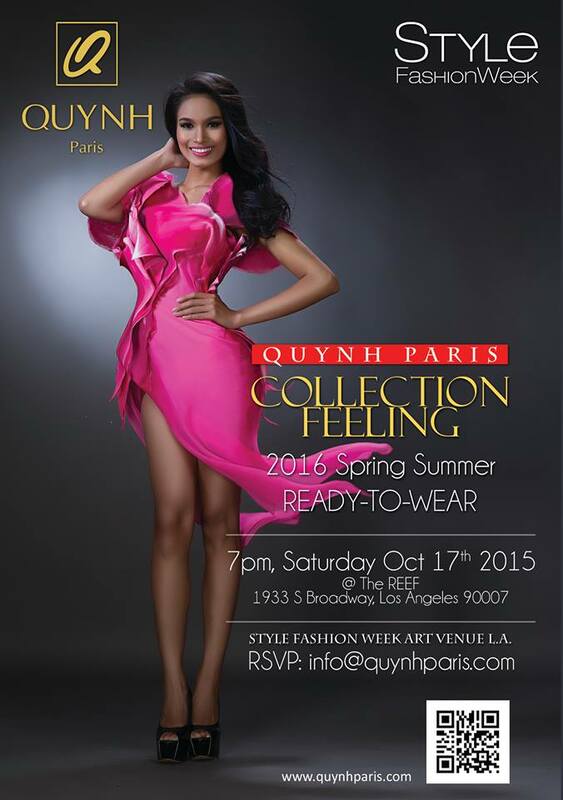 On Saturday, October 17th at 7pm, it will be the perfect fusion of East meets West, when acclaimed international fashion designer Quynh Paris will debut her gorgeous new spring-summer 2016 “Feeling” collection at the popular Style Fashion Week at the Reef in downtown LA. Quynh also was the headliner of opening night of New York Fashion Week. And noted actress Blanca Blanco wore a bold and show stopping gown of Quynh’s at the Oscars, which was the stand out gown of the night. Talk about an outfit of the day! So Quynh is definitely now an It-girl of international fashion! As one can tell in this event flyer, Quynh’s line this season is reminiscent of many things, namely nature and what bright colors spring will bring. “I’m inspired by nature and these designs convey how much this season means to me,” said Quynh. This style of this line is what many fashionistas and tastemakers call the typically cool Quynh Paris style; asymmetric, structured, 3D, artistic, romantic yet oh so modern. Quynh is a globetrotter. A Switzerland national that is originally from Vietnam, she graduated from Mod’ Art International Fashion School in Paris, the epicenter of fashion, and has already showcased her memorable collections such varied cities as Paris, Saigon, Los Angeles, and now New York City. Ever the artist, Quynh is also an accomplished painter, dancer and violinist before becoming a fashion designer, and she incorporates her love of these art forms in her stylish couture collections with volume, asymmetric constructions, 3D sculpture structures that have a life of their own, as well as fluid movements, painting and her use of rich colors and intricate details. She is Fashion Asia’s 2013 Top 5 fashion designer in haute couture. Quynh’s couture pieces have been worn by numerous pageant contest winners and contestants, top models and international celebrities. She has even been a judge herself at fashion graduation shows, fashion design or pageant contacts, particularly Miss Earth Pageant. Recently she has been the exclusive costume designer of Mozart’s renowned opera “The Magic Flute” where she let her multicultural artistic creativity express itself. Loving arts in all forms, she is about to be the exclusive costume designer for an eclectic Circus – Art performance show and once again for the opera “Carmen”.